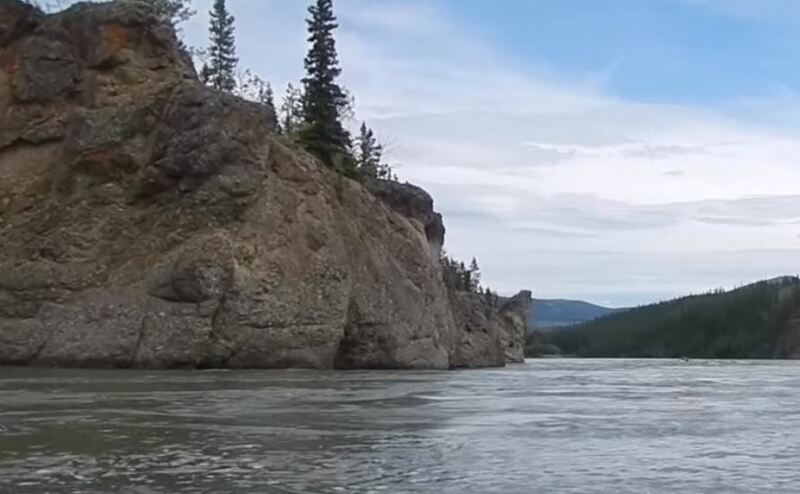 The sighting occurred along the Yukon River - just outside of Whitehorse, Yukon - just off a gravel road, near a small power sub-station - in a large grassy field skirted by aspen and pine trees. I was only 15 at the time, visiting my father over the summer vacation in Whitehorse (Yukon Territory Canada). My folks were divorced, and my Dad was a Helicopter pilot for Trans North Turbo Air in Whitehorse. That summer, I had read the book "Sasquatch" by Don Hunter with Rene Dahinden - and had always had a fascination with the subject. I'm not sure if I had a heightened sensitivity to Bigfoot - but I certainly wasn't expecting what happened that day. I was an avid fisherman, catching several grayling each day from what turned out to be my favorite fishing spot. That day - which is forever burned in my mind, I was walking on a gravel road in a north easterly direction - roughly paralleling the Yukon river (I was on the east side of the river). As usual, I approached the small light-blue power or utility shed (roughly 10ft square by about 8ft tall), I turned west towards the river to fish at a spot that was riddled with large concrete boulders. My line of sight was completely blocked by the shed as I turned towards the river. The next moment - I will always remember. I was absolutely terrified at what I saw next - a tall dark (black) rather thin figure standing about 200ft near a large stand of trees 45 degrees off to my right. When I say I was terrified - I'm now 42 years old, and I can honestly say I've never been so completely scared in my life (including almost being killed by a car falling off a hoist and missing me by 2-3 inches). My body instantly said 'get the %$$## of of there NOW!'. I immediately backtracked a couple steps and hid behind the shed - in absolute fear that 'it' saw me and I was in harms way. I was actually about 15 minutes run from civilization - so that shed represented the only thing between me and 'it. Anyway, my instinct was to ever so gently peek around the corner to see if I was spotted. Luckily it never saw me. That's when things got really interesting (at least that's what I say now in hindsight - at the time I was a basket case!). What I saw was this Bigfoot (or someone in a hairy suit) jumping or 'dancing' excitedly around an aspen tree. It was kind of prancing or hopping with its legs about shoulder width apart - its arms were 'flailing' around - it made no sound. Then, it went up to the tree and evidently tried to lift itself up from the ground from a large branch at about shoulder height. As it tried to lift itself up, the branch actually BROKE with a loud snap! That's when 2 things happened - one: I knew this was no dream - I actually heard the snap loud and clear (although I can't honestly say I saw it fall completely to the ground). Two: I wasn't about to stand around a watch any more! So I backed away from my hiding spot and carefully made sure the shed was between myself and whatever the hell it was, and hi-tailed it out of there as fast as a 15 year old can run (with my fishing rod and tackle box in hand). I mentioned it to my friends and family in the next few days - but it was mostly discarded as nonsense. A few days later (something I will always regret), I went back with a friend and looked for the broken branch or the donor tree or any footprints. Unfortunately, we were not able to find anything. I've thought very long and very hard about the whole thing - and I remember at the time that this was simply unbelievable and what I had witnessed was extremely special. I've since read just about ever book on the subject. I wish I could go back and be more critical of what had occurred - it haunts me to this day. I've told my story to a few people - but mostly don't bother telling anyone... not because I'm embarrassed - but because most people are just ignorant of the subject. I am now a VP of an IT Professional Services firm - married, and have 3 children. I firmly stand behind this story. Either someone was playing a prank - or I saw a Bigfoot doing some sort of ritualistic ceremony that day in Whitehorse Yukon..